Description: Many if not all of you know ME J. William Allen Jr., Grand High Priest of Royal Arch Mason of the State of California. You may know him as Venerable Master or in several other capacities of masonry. 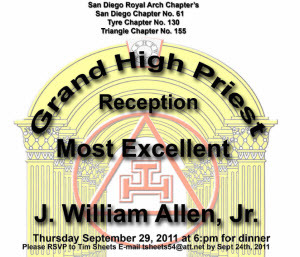 His home Chapter, Tyre #130 in Escondido, is having a reception for him on Sept. 29th 2011 at 6:00PM. RSVP’s need to be back to me via this e-mail address No Later Than Sept. 24th, 2011. So I have a chance to purchase the right amount of food. 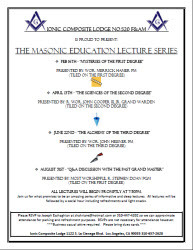 Please review the attached flyer and inform your Brethren about the event. Iif there are any questions please contact me at this E-mail address.